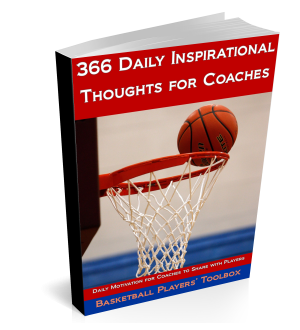 This drill is from the Arizona Basketball Coaching newsletter. You don’t have to run the drill in this exact format and can modify it to meet your personal goals. Start on Spot X1. You must make 3 consecutive shots before moving to Spot X2. On Spot X2, you must make 3 consecutive shots to advance to Spot X3. You have two opportunities to make 3 consecutive shots before you return to the previous Spot X1. Each spot begins on a make. (i.e. you complete Spot X1 advancing to Spot X2. Example: At Spot X2 you miss your first two shots but make two consecutive shots. On the opportunity to make the third shot at Spot X2, you miss and that counts as one chance. Upon completing 3 IN A ROW at Spot X5, you remain at Spot X5 continuing the pattern back to the initial starting position, Spot X1. You must make two consecutive shots before moving to the next spot. You now have one opportunity to make two consecutive shots before you return to the previous spot X1. Each spot begins on a make. If you do not complete 2 IN A ROW on the first Spot X5, you must remain on Spot X5 but return to the first portion of the drill completing 3 IN A ROW. On the first attempt you make your shot, you advance to Spot X4. If on the first attempt at Spot X4 you miss, you return to Spot X3. If on the first attempt at Spot X4 you make your shot, you advance to Spot X5.) If you do not complete 1 IN A ROW on the first Spot X1, you must remain on Spot X1 but return to the first portion of the drill completing 2 IN A ROW. Upon completing 2 IN A ROW at Spot X1, the player/group remains at Spot X1 continuing the pattern back to Spot X5. The player/group must make 1 IN A ROW before moving to the next spot. They now have zero opportunities to make 1 IN A ROW before they advance to the next spot. The drill should be timed and charted for accuracy.